A space dedicated to individuals who want keep abreast of 'Why' and 'How' of Investing. My Prime Cash portfolio completed 6 months. This portfolio has given returns of 32.6% during this period. Check the detailed performance here. This portfolio invests in socks for short to medium term. Investors are advised to read disclaimer before buying any stock. In this newsletter read about probable move in Nifty. I am sure you would have benefited by early indication of probable up-move in my last week's letter. World markets continued their upward movements, however those moves were with low conviction. In coming week we have series of events like GDP, CPI data and RBI policy are lined up. Much will depend on these numbers. 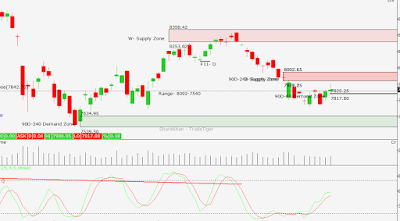 Technical Overview: Last week Nifty made high of 7959 and low of 7812. A range of 147 points. That’s a pretty narrow range of green candle to be termed as Bullish. This candle pattern is suggesting the neutral sentiments with positive bias. Nifty has resistance near 7926-8002 area. 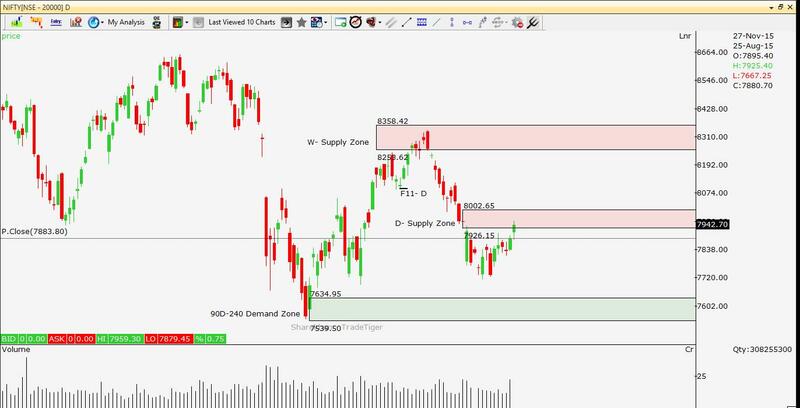 Nifty is now trading near this resistance area. 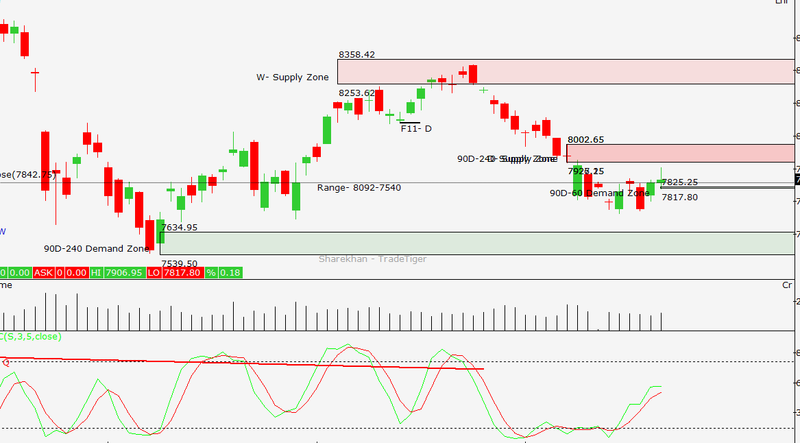 If Nifty has to see further up move, it need to close and sustain above 8002 level. If Nifty resumes its down-trend from this resistance, it can move down to 7750 in days to come. I feel, after reaching its resistance (7926-8002), Nifty can move down to retest the bottoms once. Be prepared for that down move. I run trading portfolio in Options for conservative traders and comparatively safer returns of 3-5% per month. I use hedging strategies to generate relatively safer returns per month. Click here to read more about "Index Options" portfolio. Click here for Index Options Performance. If you wish to trade in Options for safe returns subscribe here of Index Options Portfolio. Click here to subscribe to this newsletter for Free. Last week I had indicated at a relief rally which has come about and still sustaining. World markets traded mostly in green in last week. 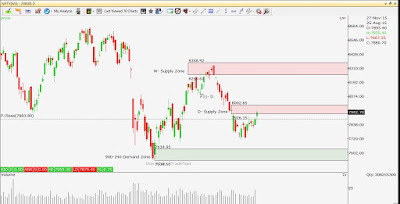 Technical Overview: Last week Nifty made high of 7907 and low of 7714. A range of 193 points. A bullish engulfing pattern is formed on Nifty weekly chart. This pattern suggests reversal of a down trend. As I had suggested last week, Nifty bounced from its support. This week we expect further up-move in Nifty. However this up-move is just a correction in ongoing down-trend. We are in F&O expiry week. Markets are expected to trade choppy with small moves. This scenario does not give trading opportunities. Better to stay away trading Nifty in Futures. Time frame till expiry. Returns expected 1.2%. Risk 1%. I had traded Nifty short strangle. The trade was taken on 6th Nov and exited on 19th Nov. This trade has made us profit of 3202 per Lot. Margin required for trading this strangle is 66000. So the trade earned returns of 4.8% in 13 days. In couple of days I will explain in on my blog why & how did I trade this Strangle. I run trading portfolio in Options (in which trades like one explained above are taken) for conservative traders and comparatively safer returns of 3-5% per month. I use hedging strategies as one mentioned above to generate relatively safer returns per month. Click here to read more about "Index Options" portfolio. Click here for Index Options Performance. Are You Procrastinating Important Financial Decisions? ELSS vs. PPF vs. ULIP : Which is better tax saving investment for the year 2019? Jubilant Foodworks - Low hanging fruit?